Because Obagi® Systems and products contain prescription-strength formulations, the systems are only available through physicians. Beautiful skin is healthy skin. It is firm and smooth, with even skin tone and glowing color. It is free from medical problems and it is normal in function and tolerance. We are born with healthy skin, but time, the sun, and environmental assaults take their toll. They do not have to win. The skin is a remarkable, living organ with the incredible ability to renew itself from the inside out. All it needs is the right kind of treatment to help it remember how. And that’s the treatment you’ll find with Obagi®. Skin health is a revolutionary idea. Most products concentrate on the concept of skin care – treating symptoms, providing surface moisture and covering up blemishes. But the only way to reclaim the health of your skin is to reach below the surface and work at a cellular level. The Obagi® Skin Treatment system combines specially developed products with medical supervision and counseling to treat your skin from the inside out. This program works on the surface to smooth roughness and correct damage like uneven skin tone and hyperpigmentation. It also penetrates below the surface to stimulate cell renewal, improve circulation and help restore your skin’s natural moisture. The results? Beautiful, healthy skin. The Obagi® NU-DERM® Program, the best available to restore Skin Health, is built on the concepts developed from years of clinical research by Dr. Zein E.Obagi, a leading and innovative dermatologist. His methods and techniques are taught all over the world to plastic surgeons, dermatologists and medical specialists. The program emphasizes the unique concepts of correction and stimulation of the skin, which lead to regulating and strengthening skin functions to produce collagen, elastin, and healthier skin cells. This leads to smooth, firm skin, with even color tone for a younger and healthier looking skin. 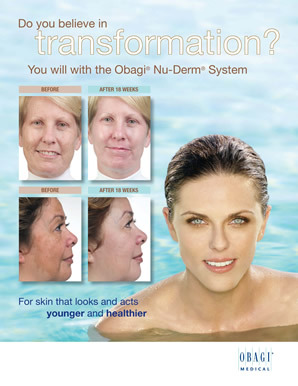 As you begin using the Obagi Nu-Derm System, your skin will undergo 4 phases of transformation. You can enjoy a complexion that’s smoother, clearer, and firmer, but remember that maintenance is crucial to long-term success! †If you experience excessive itching, dryness, or redness, discontinue use of the system and contact your physician. References: 1. OMP, Inc. Data on file. 2. Herndon JH Jr, Stephens TJ, Sigler ML. Efficacy of a tretinoin/hydroquinone-based skin health system in the treatment of facial photodamage. Cosmet Dermatol. 2006;19(4):255-262. 3. Schlessinger J, Werschler P, Kenkel J. Further enhancement of facial appearance with a hydroquinone/tretinoin skin care system in patients previously treated with botulinum toxin type A: a multicenter investigator-masked study. Poster presented at: Summer Meeting of the American Academy of Dermatology; July 29-August 2, 2009; Boston, MA. Obagi Professional-C Serums™ use advanced scientific formulas developed and tested by leading Vitamin C experts to provide maximum daily antioxidant protection against free radicals, which cause premature signs of aging including fine lines and wrinkles. Our unique formula provides greater penetration of ingredients than other Vitamin C products — delivering greater antioxidant benefit to your skin! Obagi Professional-C Serums™ use stabilized L-ascorbic acid – the only form of Vitamin C that can be effectively absorbed by the skin. Speak with your skin care specialist to choose from our 4 concentrations to determine which one is right for your skin. Obagi Professional-C Serums™ offer maximum daily antioxidant protection and greater penetration than other Vitamin C products — up to 2 times more than the competition! Revitalize your décolletage skin with the Obagi ELASTIderm™ Décolletage System for flawless, younger-looking skin. The Obagi ELASTIderm™ Décolletage System consists of a patent-pending product using Penetrating Therapeutics™ that is clinically proven to help restore healthy skin. Used together, this therapeutic system diminishes the signs of aging, helping revitalize vulnerable skin. See how Obagi ELASTIderm™ Décolletage System helped diminish the signs of aging and restore elasticity in the chest and neck area. Because your skin care needs are unique, ELASTIderm has been developed in a cream formula for those who prefer a smooth, rich consistency, and in a gel formula for those who prefer a cool, fluid consistency. 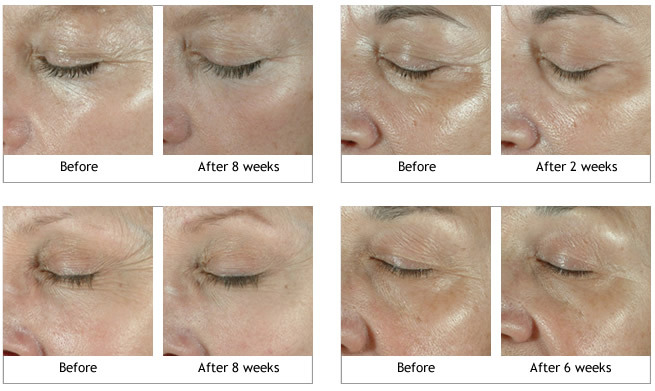 See how ELASTIderm helped bring back elasticity and reduce the appearance of visible wrinkles around the eyes. Restores the elasticity in your skin lost or damaged by age and sun exposure. Reduces visible fine lines and wrinkles by helping to restore elasticity and build collagen. The Obagi Rosaclear™ System is designed to help you achieve a clearer complexion by reducing the redness and blemishes caused by rosacea. 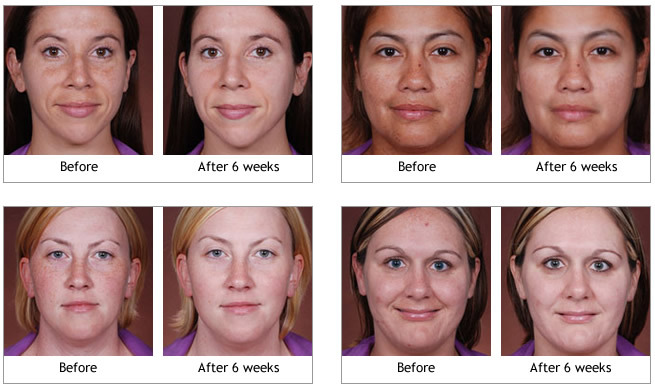 See how Rosaclear™ can help you get a clearer, calmer, more balanced-looking complexion. Photos have not been retouched. Results may vary. 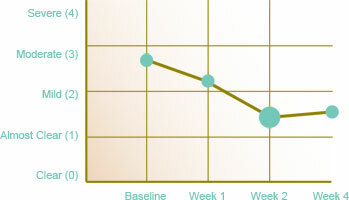 In clinical studies, 90% of patients experienced at least a Grade 1 reduction by the second week of treatment with the Rosaclear System. With Obagi-C® Rx you’re on your way to healthier, refreshed, revitalized skin from cell to surface. The Obagi-C® Rx System offers the benefits of both prescription-strength 4% hydroquinone and potent Vitamin C to correct signs of skin damage and help restore and maintain younger-looking skin.